The fireplace was long ago rendered obsolete as a primary home heating source, yet it remains a favorite gathering place. A flickering fire—wood or even gas—is a comfort, and an invitation to relax. But the hearth has also endured because of the wooden mantel that typically frames it. A mantel serves not only as an architectural anchor in a room but as a functional shelf on which to display prized possessions. That’s why so many of them still grace the parlors, dining rooms, and bedrooms of old houses even when the fireboxes have been walled over to eliminate drafts. For every surviving example, of course, there are dozens that were torn from walls during reckless remodels. 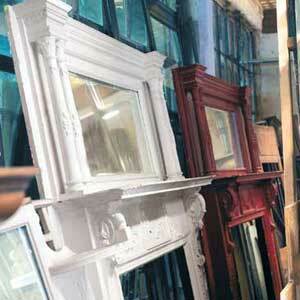 Luckily, many discarded mantels have ended up at architectural salvage yards, where renovators can now buy them to restore what may have been removed by a previous owner or to add period detail to a new house.